So which do you think was the better race – a grand prix that lasted over four hours and where spectators had to endure hours standing in torrential rain, or a sunny, on time race in a beautiful Spanish city? Montreal and Valencia could not have been more different, and the biggest difference was the racing – in Valencia there really wasn’t any. Vettel: Sebastian seems to have moved his driving onto a new level, and despite the mistake in Montreal which created Button’s victory, he really is looking untouchable. Hard to see how he can now lose the 2011 title, but stranger things have happened. Ferrari: Despite a lot of criticism Ferrari seemed to be the only team with the race pace to keep RBR in check. As usual Fernando is the one that is always there to find the sudden opportunity. He could still win this championship. Lewis’s radio broadcasts. I always enjoy Lewis claiming 100% visibility when it was chucking it down, as he did in Montreal. In the end it didn’t do him any good, but his radio broadcasts are always entertaining, or LOL as my daughter would text. I particularly enjoyed ‘ I can’t go any slower’ when his engineer was asking him to be more careful with the rear tyres, followed by ‘I can’t go any faster’ when it looked like he was dropping back towards Felipe Massa. F1 would be so much duller (yes really!) without Lewis. Jaime Alguersuari: Alguersuari has come in for some (undeserved in my view) criticism in the last few races. He silenced his detractors in Valencia with a great drive from 18th on the grid to 8th in the race. Valencia Circuit: Although it looks great, with the bridge and the old gothic fish market, but since the first grand prix it has only been able to produce mind numbing processional ‘racing’. Given that Bernie has always said there are too many European Grand Prix, it has always been strange to have two Spanish races, if we have to have two can we find a better track? McLaren: McLaren made some good calls in Montreal, but the race really didn’t work for them in Valencia, perhaps it was the high downforce, or perhaps they don’t go well at boring tracks, let’s see what happens at Silverstone. Michael Schumacher: Finished 17th, unlike some, I’ve been very reluctant to write Michael off, but as Vettel looks more and more like a champion, Michael looks less and less like one. The Turkish Grand Prix reaffirmed Sebastian Vettel and Red Bull’s dominance of the season so far, it was an exciting race, but there seems to be some developing unease about the impact of the Drag Reduction System or DRS and the effect it is having on overtaking. The Guardian’s Richard Williams seemed to capture this perfectly with the following tweet: “Another hectic GP. But does your heart sing to hear (for example) that Alonso has used his wing flap to pass Rosberg? Mine doesn’t”. Part of the problem is that the DRS provides a differential advantage to one car over another, which means the overtake often looks (as was the case in Turkey) more like someone passing a back-marker than a fight for a place in the race, we certainly did get a lot of overtaking, but perhaps not enough racing. The other main area of speculation related to Michael Schumacher, who seems to be still struggling to assert himself both as the lead driver in Mercedes and as a serious contender with the current crop of drivers. I was recently going through some old tapes of interviews with some of the senior technical people in F1, and came across one from one of Ferrari’s former technical chiefs, he made some interesting comments on Schumacher: “From a Ferrari point of view I don’t believe Schumacher is so good as a test driver. He is good at setting up the car for himself, but I tell you he is not so good as a test driver because in three years with Benetton the car was not one of the best chassis.” The suggestion being that Michael is great when you develop a good chassis for him to work with and get his own set-up, but if you want to develop the car that is a different story, however given the general absence of testing today perhaps this is a non-issue. The news that the popular Sam Michael is leaving Williams at the end of the year, along with aerodynamicist Jon Tomlinson, has also had quite a bit of coverage. If you look at Williams’ performance, it really drops off from 2005 after Sam Michael took over as Technical Director, but these things are never as straightforward as that. They also, of course, lost the manufacturer support of BMW in 2005. 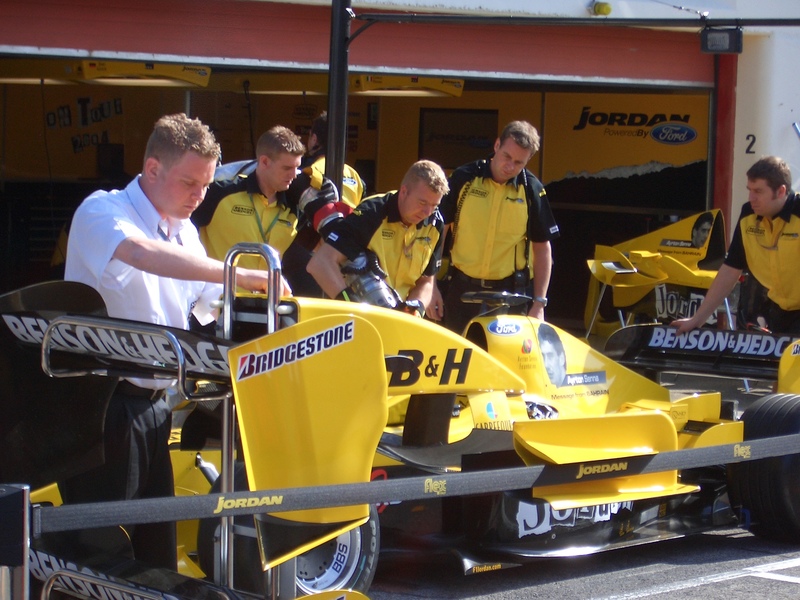 However, given the focus on aerodynamics I also wonder how much is due to them never having really got to grips with their 60% wind tunnel which came on stream during 2004, they say it’s all about aerodynamics and perhaps Williams have struggled to get their new facility to work as well as some of the other teams. It’s interesting to note that Mike Coughlan, their new chief engineer, is not an aerodynamicist. Away from the track we have the possibility of a bidder for the commercial rights business of F1 from News Corp. and the Agnelli family’ Exor SpA. This appears to have produced some interesting reactions from Bernie Ecclestone (standard response – it’s not for sale, unless they make a really silly offer) and Max Mosley (News Corp. would not be the right buyer for F1 – something to do with them owning the News of the World). The other interesting issue is the view of the FIA and more particularly Jean Todt (who some believe is supportive), and also the teams – what is their take on a Ferrari connection to F1 ownership (perhaps it just makes their implicit influence more explicit! ), and is there a place for the teams as part of the consortia? – historically they have always avoided such commitments. Either way it looks like this has a way to go before it plays out, and throws another interesting variable into the Concorde Agreement discussions. Unfortunatley due to commitments here at Cranfield I have not been able to make it up to the Autosport International show at the NEC. But I have just seen some comments made by Virgin Racing’s Technical Director, Nick Wirth, about their optimism for 2011. I think the way the Virgin car goes in 2011 will be very interesting. I always remember Jackie and Paul Stewart telling me how the second year was far tougher for Stewart Grand Prix than the first, as they were now using a car that was developed while they were trying to make a reasonable go at their first season, and so we can get a far better idea of the capability (or not) of the new teams in 2011 as compared with 2010. I suspect we will see the new Virgin affirming that their approach of using 100% CFD as opposed to combining this with the wind tunnel, as the way to go, but it might still be too soon for this to really pull away from Team Lotus and HRT. The other unknown is how Michael Schumacher will perform on Pirelli tyres and with a car that was developed with him in mind. At Ferrari’s annual Vrooom press event Fernando Alonso identified Michael as his biggest threat for 2011. So Schumacher and Virgin could be the big surprises of the season, with the other being just how many Lotus’s we end up with (what’s the collective noun for an F1 Lotus team – is it a packet?). Michael Schumacher and Ross Brawn to leave Mercedes by the end of the year: Is this another correct prediction by Eddie Jordan? To many of the current fans of F1 Eddie Jordan is just another pundit on our TV screens, perhaps overplaying his part at times, but providing a distinctive approach and voice to F1 broadcasting. However the other thing to remember about Eddie is that there is much beneath the Irish caricature he portrays and although he is undoubtedly entertaining, he also knows a thing or two about how things work and what is really happening in F1. My first meeting with Eddie took place at the San Marino Grand Prix of 2004 when Ken Pasternak, Richard West and myself were interviewing a range of team bosses and movers and shakers for the first edition of ‘Performance at the Limit’. I well remember our visit to the bright yellow Jordan motorhome. Eddie remarking to Richard, on seeing his Oyster Rolex, that he was obviously being paid too much, Richard didn’t have the heart to tell him he’d paid a few dollars for it in a market in Shanghai, but the best bit was when we were interviewing Eddie in his suite upstairs, and Ken asked Eddie how he went about selecting drivers for his team, perhaps hoping for some details of psychometric tests, Ken was rather taken aback when Eddie leaned forward and fixed him with a manic stare – ‘I look them in the xxxxing eyes’, he said slowly, leaning ever closer to Ken, who was now moving back as far as he could manage, ‘and I ask them, have you got what it xxxxing takes?’, still moving forward, Ken still moving back ‘have you got the xxxxing balls to make it?’ at this point Ken was virtually climbing backwards out of the window, Eddie chuckled and satisfied with the reaction relaxed back into his seat. If we look back to this time last year when the rumours of a return to F1 by Michael Schumacher were building up – who was the person that actually broke the story that, even after being unable to replace Felipe Massa at Ferrari in 2009, Michael was planning to return to Mercedes in 2010? It was Eddie Jordan. Well Eddie now has an update to the story which he has posted on the BBC F1 website and it has two aspects to it. The first is that Michael is now changing his mind about continuing with F1 into 2011, and the second is an even bigger bombshell: that due to disagreements with Mercedes management Ross Brawn may also not continue with the team. Now clearly counter-arguments can be put to both of these, and indeed I’ve also blogged as to why I think Michael will stay for 2011, and of course some of this could be part of a negotiation process. But if Ross walks out that would be a significantly different dimension and one in which it may be easier for Michael to also decide to go too. All of this is conjecture of course, but don’t forget, Eddie Jordan has been right before.